Skills & Obstacle Fun – NEW! Learn the fundamentals of acrobatics/tumbling skills in a fun, fast-paced environment, play high-energy movement-based games, and put your new skills to use in gymnastics-based obstacle courses! A lot of movement, tumbling and gymnastics skill-building, and fun! Little All Stars Class – NEW! Through cooperative games, obstacles courses, and relay races, children will explore the basics of sports like soccer, baseball, basketball, volleyball, tennis, and more in an enriching and reinforcing environment. Little All-Stars is a great class for children to learn to work together, strengthen their fine and gross motor skills, build confidence, and get moving! Tumble Tots for ages 1-2 – New! Action-packed adult participation classes for infants and toddlers. In a safe and fun environment, little ones will navigate through gymnastics courses – tumbling, climbing stairs, walking on balance beams, stretching, singing, playing parachute games, and popping bubbles! Children will increase their fine and gross motor skills, core strength, and hand-eye coordination. Enjoy watching your child build their confidence, learn new skills, and climb to new heights! FUNdamentals of shooting, passing, and dribbling will be taught with the emphasis on FUN. Kids will get a chance to put their skills into action during scrimmage time. This class will help prepare your child for fall or winter basketball leagues. Bring a water bottle and wear appropriate shoes. 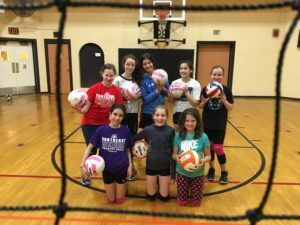 Learn and improve the basic skills of passing, setting, serving and hitting in a fun and positive environment, and engage in a little friendly competition. All skill levels are welcome. Get a terrific workout in a positive, low-key setting with an experienced coach. Focus will be on teaching the FUNdamentals of dribbling, passing, shooting, defense, and teamwork, with a scrimmage game at the end of each class. Perfect for the beginner or the player looking to sharpen skills and stay fit.